Way way way back in late November we hopped on the Eurostar and headed to Paris for a long weekend. If you’re going to miss turkey and football on Thanksgiving you might as well be in Paris. Even if it’s cold and gray and rainy I think, “Paris is always a good idea*”. Unfortunately I forgot (quelle surprise!) to bring our camera out and about with us most of the trip so most of our photos were captured with our iphones. 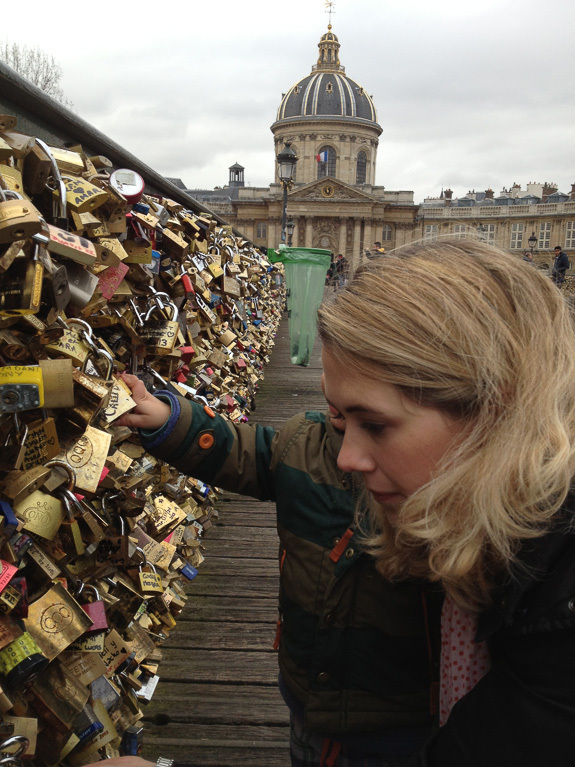 Some of the best iphone shots we took were at the Pont des Arts where we (read: Rachel) couldn’t contain our cheesy tourist impulses and added our own “love lock” to the famous bridge. Hilariously, we didn’t know if it was illegal or not so the whole time we were putting the lock on the bridge we acted like sketchy fugitives. It turns out it’s not illegal but it’s not exactly beloved by Parisians either. If you’re interested, I found an article about it in the Wall Street Journal after we returned home. 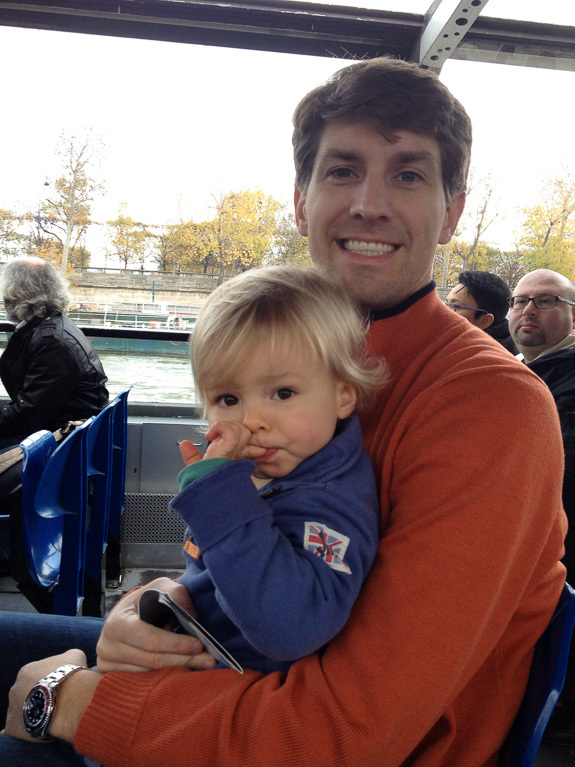 After fleeing the scene of our vandalism we hopped on a lovely boat tour of the Seine. 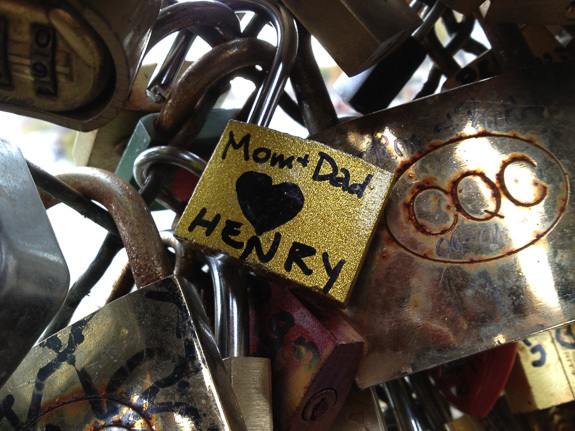 Which was a HUGE hit with Henry because it was one the handful of words he reliably said at that point. We cruised along and pointed excitedly to La Tour Eiffel and of course yelled, “BOAT, BOAT, BOAT” to all of the other boats on the Seine. Bonsoir! It’s off to bed for me but I’ll post more pics of Paris soon. 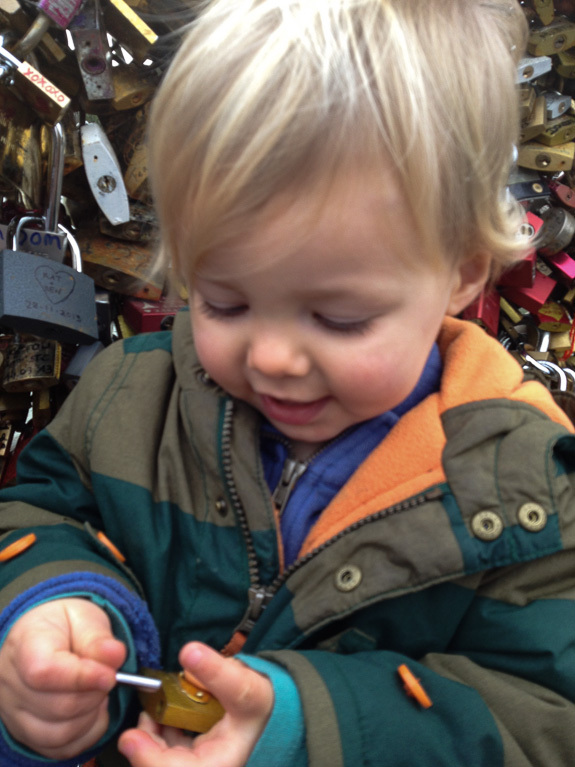 And also more recent adventures from Brussels and Barcelona. * I’ve been seeing this quote everywhere lately, especially on Pinterest, and it’s always attributed to Audrey Hepburn. But since I’m a huge nerd I wanted to know exactly when/where she said it. Usually people cite the film Sabrina (1954). However I can’t for the life of me find it in the script or anywhere else. It is definitely in the script for the 1995 remake of Sabrina in which the title character is played by Julia Ormond. And while I love the sentiment regardless, I’ll be a little sad if it isn’t actually something Audrey Hepburn said. Not to mention all the incorrect Pinterst posts (heaven forbid!!!). I’ve already spent way too much of my precious toddler free evening hours researching this so I’m moving on. But if anyone else wants to do some sleuthing I’d love to hear what you find.